It is the sixth accident to date involving the modern made-in-Russia training aircraft. December 27, 2017 - Two Bangladesh Air Force (BAF) Yak-130 "Mitten" advanced training aircraft crashed after collision during a night flight. The accident happened in the country’s Cox’s Bazar district, 292 km southeast of capital Dhaka. According to Inter Service Public Relations (ISPR) of Bangladesh Army, the pilots ejected safely. The two jets collided in mid-air at approx. 6:30 pm LT and they slammed on the ground at a distance of four kms from each other. 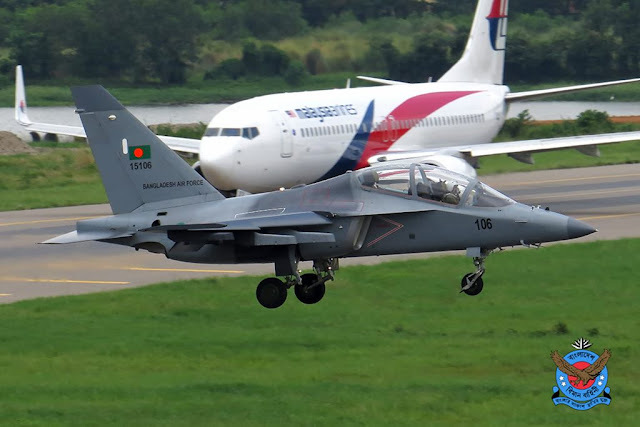 The Yak-130 is one of the most advanced aircraft in the inventory of the Bangladesh Air Force, the nation received the first planes from Russia at the end of 2015. The brand new Bagladeshi trainer jet did not have a good start, this year is the second accident involving the Balgladeshi Air Force Yak-130. The first mishap happened on July 11, 2017, when a Yak-130 crashed at Lohagora, Chittagong. According to the BAF preliminary reports, the plane soffered a technical failure of the Fly-By-Wire system. It is the sixth accident to date involving the modern made-in-Russia training aircraft. Three months ago a Russian Yak-130 crashed while it was conducting a training flight (More details here). The Bangladesh Air Force purchased 16 Yak-130s with an option for additional 8 aircraft. The deliveries of the planes were completed in the beginning of 2017.